My son just loves apes, all sizes, shapes and nature! I think he feels a kindred spirit with their curious, mischievous side and the ease and ability with which they swing and climb. As his mother, watching him grow over the last seven years, I can certainly vouch for these similarities between boy and beast! However, that is where the analogy ends. There is a darker side to many apes such as chimpanzees and baboons; they are often know for their aggressive, bullying and violent nature! That is, until we look at the laid back left side of the Congo river, the exclusive habitat of the Bonobo ape (Pan paniscus). Although similar in size and shape to the chimpanzees of the right bank (Bonobos tend to have slightly leaner bodies, longer limbs and smaller skulls) these apes are defined by their “make love not war” attitude to life! So, is this laisser-faire attitude really what is seen in bonobos in the wild? What makes the bonobos such placid creatures? So why are the bonobos so much more placid? Some of the answers lie within their food choice and its supply within their habitat! Bonobos are similar to chimpanzees in that they eat fruit, leaves and a bit of animal protein; the big difference though is that they are also fond of local herby vegetation. This vegetation is a good source of protein and sugars and, even more importantly, it can be found all year round! The bonobos are not frequently challenged by the threat of food shortages and starvation. This allows them to forage in large, social groups, ensuring that each individual may have continuous social connection and back-up. The chimps on the other side of the river are not so fortunate! Their diet is more restricted and therefore more scarce! This immediately adds stress. The requirement to find food arises, along with the need to fight for it. These stresses are at the basic level of survival and inhibit the development of large and strong social bonds. It also explains the incidence of cannibalism among chimpanzees. Empathy is another trait associated with bonobo interaction, thought to be developed from an early age. Comparative studies of the chimp and bonobo at a neuro-biological level have shown significant differences between the two apes and provide biological support for the suggestion of empathy among bonobo populations. Are bonobos always chilled out? 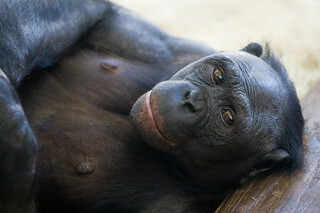 Current studies are looking at stress levels in bonobo apes. By examining the levels of the stress hormone cortisol within urine samples taken from male bonobos it would appear that high ranking males do appear to get “stressed out” sometimes. The cause, not too surprisingly, appears to be the presence of a female. In a society known for its peaceful behaviour it must be very stressful trying to remain calm and cool when vying for the affection of a pretty “lady”. What about their family tree? Which ape do you think we most resemble?